I have found my new favorite bible! 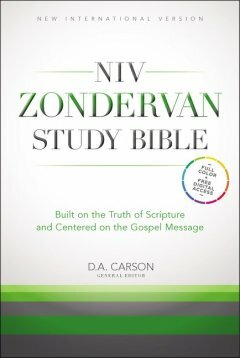 The NIV Zondervan Study Bible is the bible that I have been waiting for! I can't say enough of the greatness and beauty, as well as the utility of this bible. The pursuit of the perfect bible has come to a closure!!!! I know in a previous review, I said that Zondervan's NIV First Century bible takes first place with the NKJV full color study bible in a close second. For anyone already familiar with the NKJV study bible- this NIV Zondervan Study is comparable in the in-depth study notes, graphs and full color photographs. This is the newly released NIV Zondervan study bible- published in full color! The simple, minimalist, modern book jacket gives little clue to the visual goodies contained within. The pages are simple yet full of colorful study helps, photos and maps. The quality, durable textured hard cover will last with heavy use. The pages are perfect as far as their thin texture which is also durable. As far as the content and presentation: I found it to be similar to the NKJV full color study bible and the newly published NIV Essentials study bible. If you find yourself stuck in a deadlock contemplating which bible to choose: This NIV Zondervan Study bible, the NIV Essentials bible or the NKJV study bible- I'd choose this one. The biggest difference between the newly published NKJV Study bible by Thomas Nelson is that this is a NIV translation. The NKJV is more literal and traditional in style and language than the NIV. The NIV essentials bible is black and white with some spot color which seems like an adequate bible until you have been exposed to the beauty of a full color bible. If you want to own one single bible that is good for study as well as beautifully designed and illustrated, the full color NIV Zondervan Study Bible is the only bible you will need. This bible is great for new bible readers as well experienced readers. As far as everyday study, the font is okay in standard size but still on the tiny side. But that is understandable given the amount of content and the size of this bible. As it is this bible is bulky and not really the optimal choice to carry around. It is nice to see that the zondervan publishers recognized the need for a full color bible- with an abundance of study resources and photos from the historical point of view. I do not feel any bible reader would ever need to buy another study bible. Perhaps teachers, sociologists, history enthusiasts and tourist travelers will be drawn to this bible as well. If you are wondering why to choose this bible over the most recently published full color bibles- I'd choose this particular bible if you prefer the NIV. There is some similar content such as illustrations, maps and charts that you will find in the First Century and Essentials bible as well as the NKJV STudy bible. Therefore its redundant to own all of these bibles in my opinion unless you collect bibles. The digital access can be used through an enclosed card with a code. These days many college textbooks come with digital access. There are two options for digital access- lap top and tablet/ cell versions. I chose the android format which lead me to the olive tree app. I found that installing the digital access was not particularly easy. I am unsure if I was able to unlock all the features. I was only able to view the NIV text on my mobile device- no additional photos or charts.. Some readers might be confused into believing the digital access is the digital version of the NIV Zondervan study bible. So far I found that not to be the case. Nevertheless I enjoy this bible as a bible- and digital access is not at all important to me. I only wanted to try it simply to take a look at what it offered. For anyone looking for a good bible that will provide a lifetime of value and study, this is it!- The top bible among the top choices in my opinion. I think any bible reader will be impressed. As a blogger for booklook I received a copy of this bible published by Zondervan.